Promising, but not yet good enough to replace the more complicated tools. The Northern Suffolk Christmas Bird Count (CBC) found a Mountain Bluebird at Rt 25A and Hulse Landing Road near Wading River over a week ago. However I just hadn’t been able to convince myself that it was worth driving that far to pick up a rare but regular vagrant, especially after very nearly striking out on much closer birds two weeks ago after Brooklyn’s CBC. Then yesterday on the Southern Nassau Count Doug Gochfeld found an incredible Grace’s Warbler much closer at Hempstead Town Park in Point Lookout. This is a first state record, and probably the northernmost and easternmost record ever for this species, which otherwise you’d have to travel to Arizona to find. I still wasn’t convinced though, since the bird disappeared yesterday around 1:30 after being very cooperative for about three and half hours. It felt like a one day wonder, and the weather today wasn’t looking good. But when Steve Walter reported a “warbler sized bird” around 8:30 AM, I started packing my bag; and when David Speiser reported a definite sighting shortly after 10:00 AM, I clicked the “reserve” button at zipcar and headed out the door for Point Lookout. When I arrived at Hempstead Town Park about 60 minutes later (after narrowly avoiding being sideswiped by a car full of women birders who did not know which way they wanted to turn off the Loop Parkway –check a map before starting out folks) the bird was staked out but not showing itself. A couple of times someone thought they saw movement, but couldn’t say what it was. About 15 minutes later, Lenore Swenson and Starr Saphir showed up in a taxicab after taking a train in from the city. Memo to self: when possible stand behind Starr. She found the bird in less than five minutes. However I was a few meters down the road from her at the time, and by the time I got over to where she was and pointed into the same tree, the bird had dropped down and out of sight again. At least it wasn’t hunkered down completely in all the wind as I had feared. Five minutes later, as almost everyone including me was scanning and rescanning the same tree where it had recently appeared, hoping to see something move, Lenore spotted it in another tree off to the left; and I got on the bird this time for maybe a full 30 seconds or so as it moved up and down and around the pine, scavenging for what insects it could find. At first I thought I might be looking at a Ruby-crowned Kinglet. The back was sort of blue-gray with wingbars. However eventually it turned its head toward me, and I could clearly see a bright yellow throat, and yellow superciliary, and no kingletish eye ring. Bang! #800 Grace’s Warbler. Normally I’d stick around and try for a photo and maybe scope views. However it was damned cold and windy out there. More importantly, as long as I had already rented a car and driven all the way out into Nassau County already, I wanted to try for the Mountain Bluebird too. So I said a quick goodbye, and hopped into the Sentra and headed up the Meadowbrook to the Southern State. 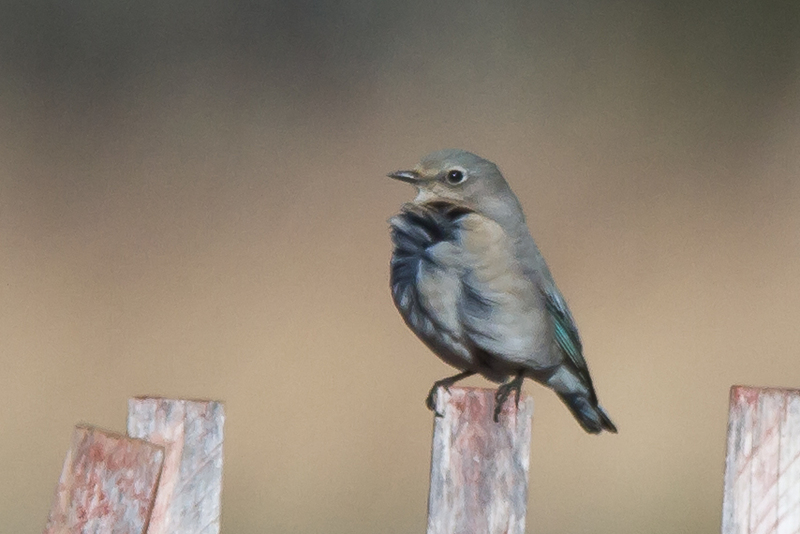 I was hungry but I decided to skip lunch until I had at least tried for the Mountain Bluebird. If it wasn’t being cooperative, I could grab lunch in Suffolk County, and then try again before dark. You are currently browsing the Mokka mit Schlag weblog archives for January, 2012.